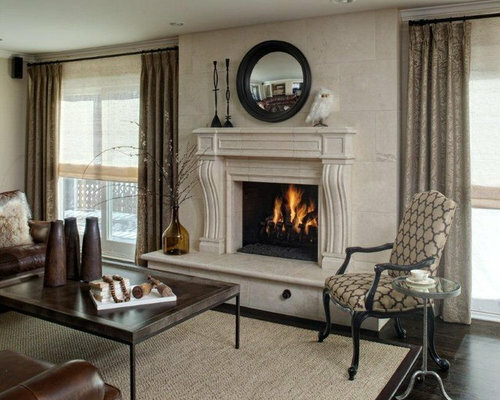 This Highland Park, IL home reflects a transitional to modern design aesthetic. 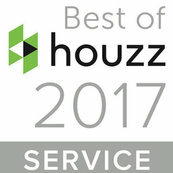 What makes this home transitional? The Dark brown, taupe and white colors. Mix of curved lines with straight. Also take not of the perfectly placed plants. What makes this home modern? The wooden floors, "openness" of room spaces, and simpler doors, windows & walls. Walking into this kitchen is like taking a breathe of fresh air! The natural lighting shining through from the windows of the kitchen doors, plant centerpiece, and use of white make this a very breathable open atmosphere. 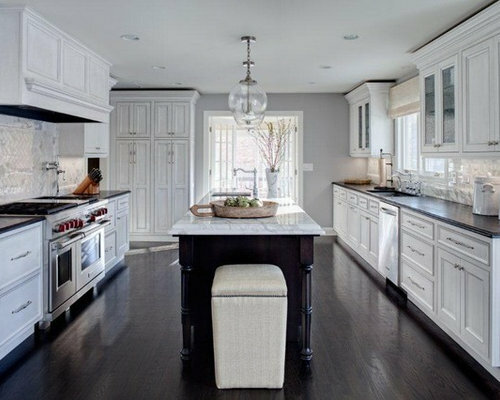 Very spacious white marble island and dark kitchen counter tops for making delicious recipes. Stainless steel appliances fit perfectly with color palette. 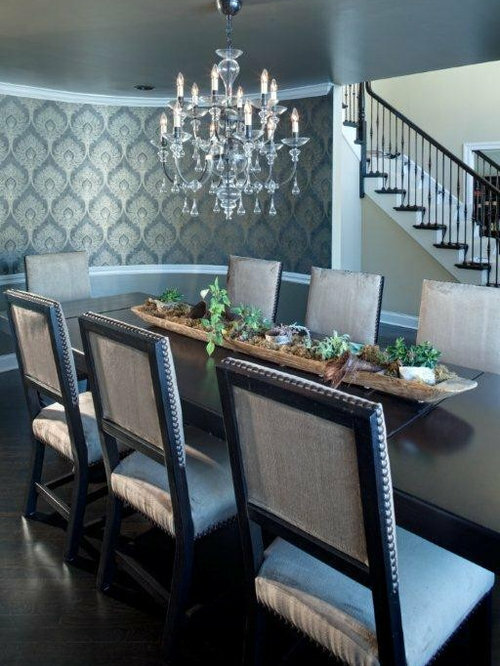 A contemporary dining room in Highland Park featuring upscale wallpaper, long dining table, beautiful glass chandelier and square back dining chairs. Enjoy a meal surrounded by friends & family in a contemporary dining setting, designed with breakfast and lunch in mind. 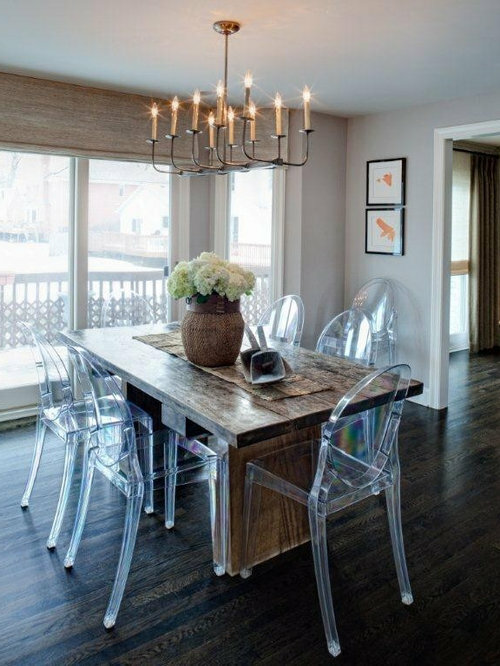 Clear plastic chairs stand apart from the "farmhouse" style of this room. Sip tea while resting next to the stone wall fireplace during cold the colder months. While the dark hardwood floor, rectangular rug and straight edged coffee table create a modern look, the patterned chair, clear glass side table and round wall mirror bring in the contemporary style. 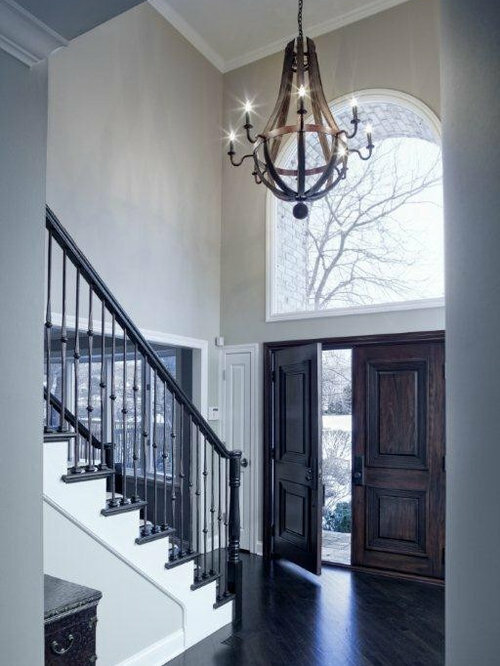 Walk into the entryway of this Highland Park home and be greeted by a large black iron staircase and wood metal chandelier. The light from the large archway window and width of the double doors create a welcoming feel.